This time of year is fun for so many reasons. Holiday events, baking all season long, and making gifts for friends and family whether that is homemade holiday cards, ornaments, and so much more. This year we received some goodies from Crayola to make some super special holiday décor gifts for family. 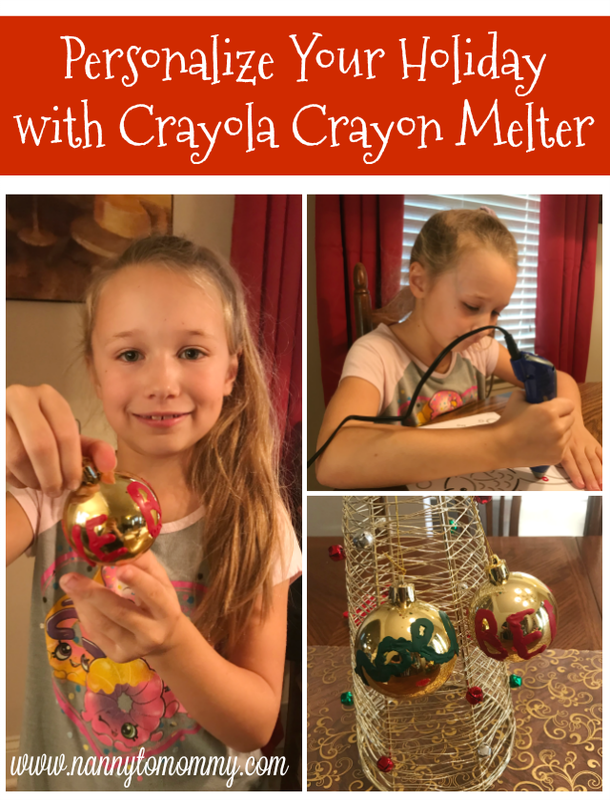 Crayola Crayon Melter brings renewed life to Crayola crayon sets everywhere with melted crayon artwork that's easier than ever before to create. That's right! Now you can use up those broken crayons and make beautiful artwork to share with everyone. 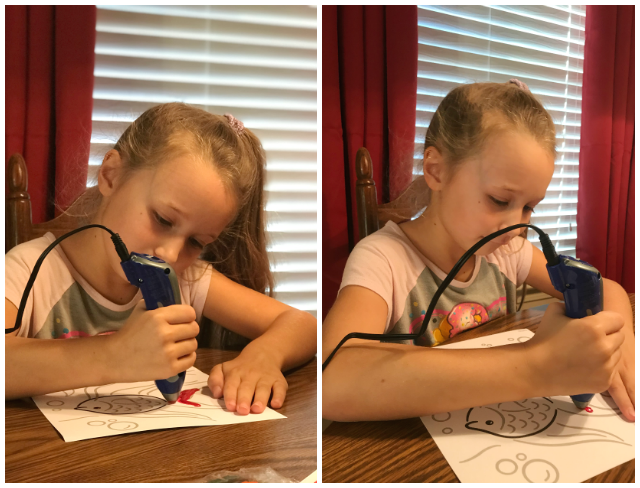 I love the Crayon Melter because being a frugal mom, I love that we don't have to just throw the broken or small crayons away. My son is notorious for breaking crayons and with the melter I can give them new life. It has a low-heat tip and dries cool, so it's safe for kids 8 & up to enjoy. Simply use the included wrapper-ripper to remove labels from crayons and insert a Crayola crayon only into the heated melter unit to get started. My daughter and I decided to re-pupose some old ornaments by using the Crayola Crayon Melter and adding words. We only made two in red and green (one says BELIEVE and the other says NOEL), but we have so many plans to make so many more things. I want to buy a canvas and just let her decorate her little heart away. We could give to a relative or keep and hang it in her room. I love our new ornaments on the tree, such an easy way to remember this Christmas. We also received the Scribble Scrubbie Pets that I think will make a fun gift for niece. She LOVES dogs. Color, Rinse, Re-Pet! 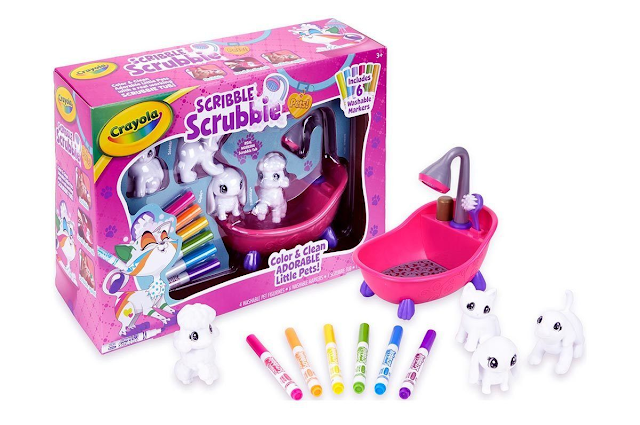 Crayola® Scribble Scrubbie™ Pets! are adorable, colorable and washable pet figures that little would-be groomers can customize again and again! Choose a pooch or get smitten with a kitten and color with the 6 included Scribble Scrubbie™ Washable Markers. And when you’re ready for something new, pop ‘em in the Scrub Tub to get cleaned up. More characters are sold separately. What do you think of these gift ideas from Crayola? Do you like making homemade gifts? That's a pretty cool gadget. I like the idea of making ornaments with it.